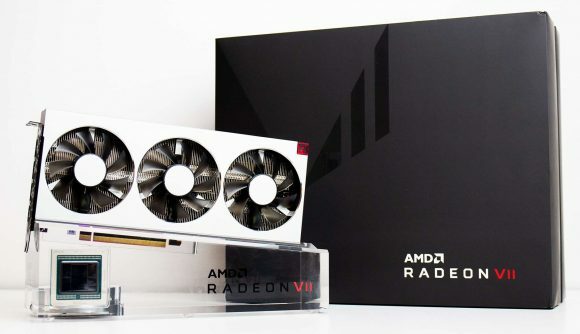 There may be less than 100 AMD Radeon VII GPUs in the UK ahead of the graphics card’s February 7 launch – or so says an employee at a major UK PC hardware retailer. Over at the OverclockersUK forum, one member of staff posted that the company has been allocated just 44 units of the “world’s first 7nm gaming GPU”. Needless to say, those 100 graphics cards aren’t going to go far on an isle with over 60 million inhabitants – that’s 0.00000151515 Radeon VIIs per capita – but more are reportedly on the way. 58 units are expected as of tomorrow at OverclockersUK, the employee continues, although shipments beyond the initial launch units have not yet been confirmed. This follows claims that GPU supply would be limited for the 7nm card, with AMD reiterating recently that it has enough Radeon VII units available to “meet demand from gamers”. But claims of 100 cards may be exaggerated. It’s unlikely that any single retailer has the complete picture on the total number of cards shipped across the country – so take this with a big heap of sodium. Other retailers are said to have amounted more than 50 cards at launch too, and, while evidence is mostly anecdotal at this point, the maths just doesn’t add up. AMD will launch its next-gen Radeon VII tomorrow, February 7. We expect only the triple-fan reference fare to grace the store shelves at first, with third-party designs to follow at a later date – or at least that’s what leaked product SKUs would have us believe. It was a long while until third-party/factory overclocked RX Vega 56 and RX Vega 64 graphics cards made it to market, and by that point the cryptocurrency demand had made them all but entirely redundant. Still, it looks like the Radeon VII might turn up in non-reference garb sooner rather than later… but don’t hold me to that. AMD believes the card will outpace Nvidia’s RTX 2080, and that claim is somewhat backed up by 4K Firestrike Ultra leaks. Yet in Time Spy the Nvidia GPU retakes the lead. There’s not long to wait now either way, and you can check out our full review later this week for the complete picture.